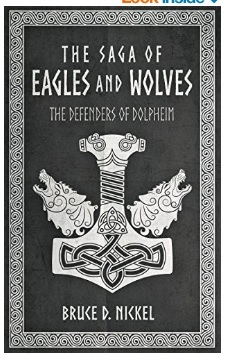 The Defenders of Dolpheim - The Saga of Eagles & Wolves by Bruce Nickel. Don't waste time reading this review, go buy a copy and invest your time enjoying a great book!! I really enjoyed Bruce's book. I hope it is the start of many to follow. Like all books that have characters, you - the reader, need to be properly introduced to the characters. This takes some pages to do. Also, you need to understand how a village operates day-to-day life in the time period being used in this story, this also takes pages. And, you need to know the enemy/foe. This builds context and proper back story. Without this foundation you would not truly enjoy this Saga. Once, the author has completed the task of educating you on the characters, daily life, the threats and builds up the suspense of first contact, then....then, this story accelerates into a page turner that is hard to put down. Bruce's love of his ancestors and former military service aids greatly in turning words into painted images of battles on foreign fields in ancient times. The details needed to wage war in the old days are not lost on Bruce. His narratives keep the imagery flowing as fast as the building tensions for battle. There is no shortage of grizzly, bloody details on combat in Roman times in this book. For those with a more academic approach, this book is a good study of asymmetrical warfare and the evolution of battlefield tactics to survive when outnumbered by a superior force. Superior in numbers. Superior in weapons technology. Superior in daily training. Superior in hierarchy and logistics. Superior in attitude/arrogance. In the end, like most asymmetrical situations, the invader is the invader - no matter how many; and the defender is the defender - no matter how few. Home turf advantage, plays a roll here. Speed, violence & aggression on the field of battle play a larger roll. I had the pleasure & honour of serving with Bruce in the Balkans back in the mid-90's. He is a good person, who has written an excellent book. Get out there and buy a copy for yourself! Bruce has done a great job and written an excellent book. It was a page turner right to the last page. My only comment now is: When does the next chapter of the Saga get released???? Until next time......read a good book!! It was a cool, damp Autumn morning when we arrived at Briden Solutions, West of Calgary for their open house on the 15th of September 2018. I was given a choice setup location between Mobile Escape - escape rooms trailer and the food truck. I was in the right spot to grab the attention of everyone coming outside for their free lunch. Needing to leave the path clear to the food truck I used the second set of grommets on the tarp to shorten it and also provide a bit more side cover to stove setup under the tarp. 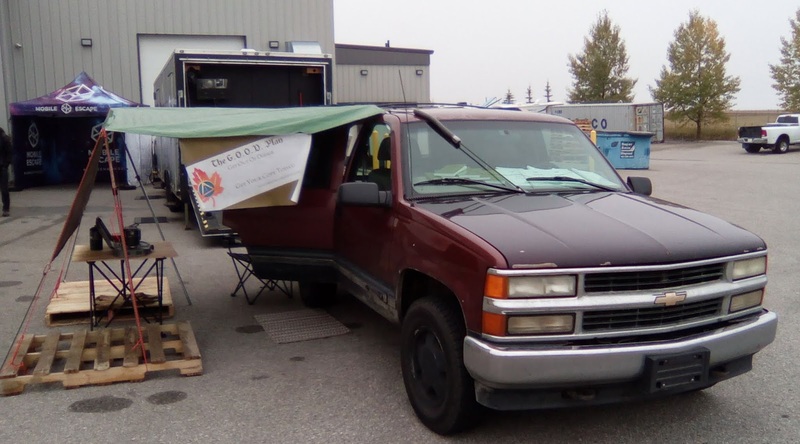 The tarp awning is very versatile. I also improvised with the pallets, thus not damaging the tarmac will large spikes. Emergency preparedness is all about assessing the situation & improvising a solution. While inside for a few minutes I picked up a few items for my pantry. 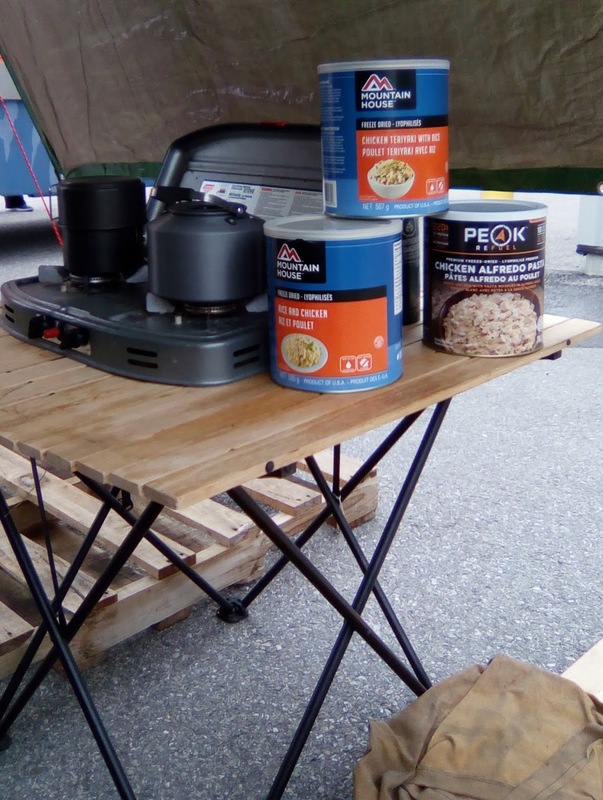 Mountain House Chicken & Rice (a family favourite), Teriyaki Chicken & Rice (new flavour for us) and Peak Refuel Chicken Alfredo. 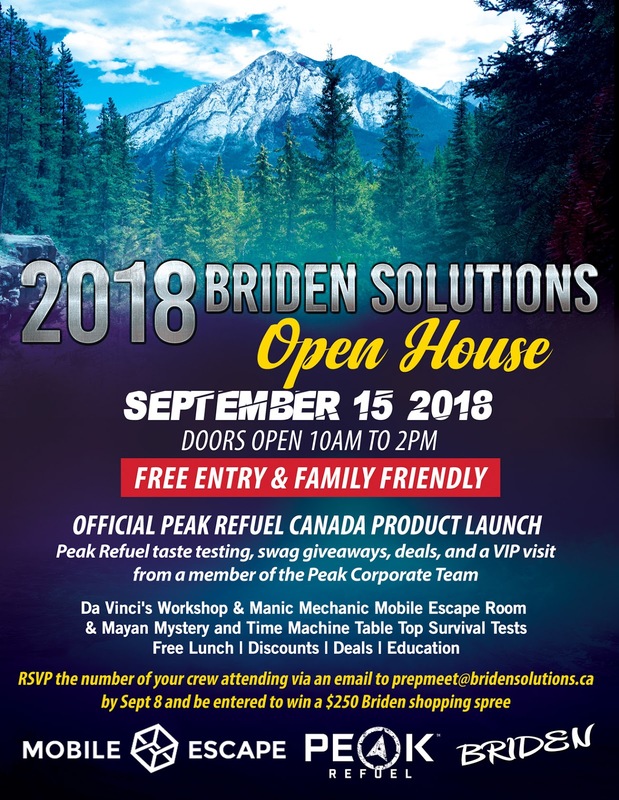 The new Peak Refuel line of food products were the star of Briden Solutions Open House. They has rep onsite and were preparing and sampling all their products. I sampled the Chicken Alfredo and was very impressed. There was no lack of flavour nor a lack of meat. Many companies would go heavy on the noodles and have a few bits of chicken or chicken flavoured TVP(textured vegetable protein). Peak Refuel prides themselves on only using real meat. The meals cost more, however, you are getting more. 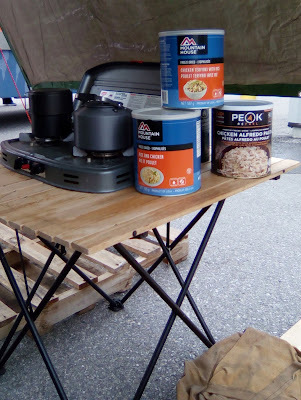 So if you want to be surviving with meals close to home cookin', add a few #10 cans of Peak Refuel to augment your emergency ration pantry. Store what you eat, eat what you store. For a price comparison the #10 can of Mountain House Teriyaki Chicken & Rice is about $38 a can, while Peak Refuel Chicken Alfredo is about $74 a can. Both of these are good to eat, even when it is not an emergency. They both store for up to 25 years and come with plastic lids to seal the can once opened. Even if you have rice & beans as your family main stay, every once in a while you will want to reward good behaviour with a change of meals. Peak Refuel will fill this properly. As I spend most of my time out near my BOV display I did not get to see everybody who arrived, however, the lineup for lunch was steady and well populated. I did manage to sell a copy of The GOOD Plan and one was earned as a prize. Would have sold two if the prize winner hadn't just purchased a copy. Thanks again, Dwight, it was great coming out to your shop and helping you, helping others to be more prepared. Until next time......stay connected with your supplier!! Folks, sorry for the short notice. I have had some technical issues here, which will hopefully be corrected today. Dwight Briden and his company has been supporting the emergency preparedness community for many years, as both a business and as a place to gather more knowledge. If you need a local source for long term storage food items that have up to a 25 year shelf life, Briden Solutions is the place for you. If you need water storage solutions or filtration options, they have those as well. Visit their website (https://www.bridensolutions.ca/ ) to learn more about what you can get locally. An open house event like this is also a great place to meet other like-minded persons who share an understanding about the need for being prepared. When the emergency preparedness community gets together a lot can be achieved - from learning new skills to meeting new friends. & your emergency preparedness community!! PS - Copies of my book, The G.O.O.D. Plan - Get Out Of Dodge, will be available at this event. Autographs, too. Limited number of copies will be on hand.